Multiple Spindle Drill Heads are usually supplied with a collet style spindles. Collet style spindles, with their compact design, allow close center to center distances. A customer with an application that required frequent tool size changes asked if simple key-type chucks could be provided in place of the collet style spindles on a Adjustable Twin Spindle Drill Head. They did not need very close spacing so the larger key-type chucks would not cause any problems. 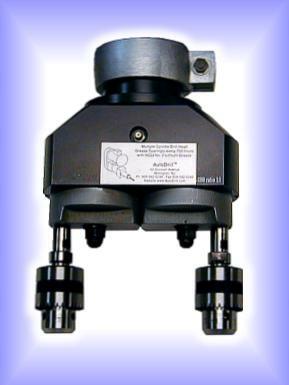 We provided the Twin Spindle Adjustable Drilling Head below for the solution.